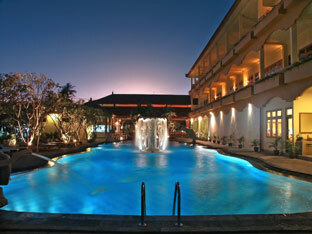 Febri's, our new 3-star hotel, is centrally located on the main Kartika Plaza street, South Kuta Beach. Also known as Tuban, the area has recently become the shopping icon of Bali with its majestic Discovery Mall, Central Kuta Shopping & Entertainment complex, and Kuta Art Market. Family facilities are also widely available such as Waterbom Park, Go-kart track, Reverse-Bungee Jumping, Bowling Center, various ethnic & theme restaurants, etc. Inspired by the Balinese Water Palace, the hotel is of contemporary design with high ceilings and large open spaces in most areas. Providing a pleasant & relaxing ambience, Febri&#8217;s is ideal for families, but honeymooners will especially enjoy the spa facilities. The hotel has 2 types of rooms: 49 Superior Rooms and 20 Family Deluxe. Superior Rooms are contemporarily designed with light & soft colors and furnishing reflecting a fresh and tropical ambience. All main beds are orthopedically designed for proper spinal alignment, hence they are perfect for travelers with sensitive backs. Every room has a large sofa bed which is extendable as an extra bed. 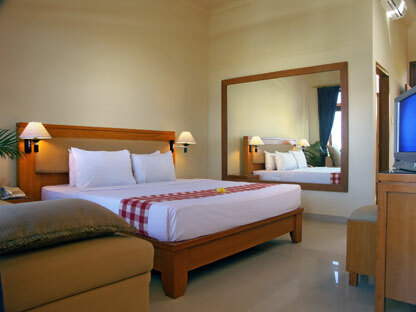 With 20 Family Deluxe rooms, Febri&#8217;s is proud to be the largest &#8220;family&#8221; hotel in Bali. 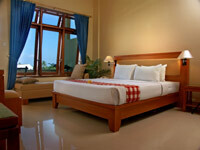 The Family Deluxe room of 52 square meters is definitely the biggest &#8220;family room&#8221; size in Bali so far. Each can accommodate 2 adults + 3 children comfortably. Very clean room with ample space for long holiday. 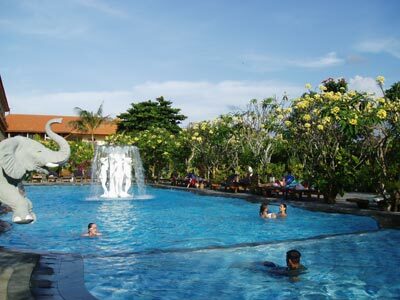 Centrally located at Tuban (or known as South Kuta Beach), it is only 2 to 3 minutes walking distance from Tuban Beach, 3 minutes from Waterbom recreational Park and the famous Kuta Center shopping complex + Discovery Shopping Mall. The hotel is located on the main street and is surrounded with many art/souvenir shops, restaurants, minimarts and laundromat. International and Indonesian cuisine. Very famous among passing trade & holiday makers. Attached to the cafe with international beverages and local beers. Daily breakfast for 2 persons is included. Deposit is required to guarantee bookings. 1-night is required in normal season. Up to 3 nights are required in high & peak seasons. Cancellation fee is applied for no-show or cancellation within 72 hours prior to arrival. 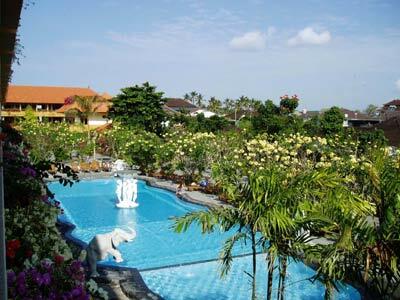 Centrally located at Tuban (or known as South Kuta Beach), Kartika street, right opposite Santika Hotel. From airport, turn left to Dewi Sartika St. until junction, turn left again and go to Kartika Plaza at the next junction. Follow the main street for approx 700 meters and Febri's Hotel is at right side of the street.